If you’re in the market to refinance your loan, then you probably know the lender you choose makes a difference. Low interest rates are important—but they’re not the only thing. If a streamlined digital experience is important to you, you should check into refinancing with Laurel Road. Laurel Road offer student loans refinancing for all college grads, but this lender has some rather unique options as well. It has special refinancing packages built especially for medical and dental students, as well as parents who’ve taken out loans for their children. Their flexibility and low interest rates make them well worth your consideration. Why refinance your student loans with Laurel Road? Laurel Road has small-town roots, but it has grown into a national online lending powerhouse. This lender started its life as Darien Rowayton Bank of Connecticut, a traditional local bank. Seeing a clear need among tech-savvy millennials, the bank’s top brass decided that they could better serve their customers’ with more tech-driven options. They set to work on transforming their community bank into a national online lending organization with customers throughout the country. Laurel Road was one of the first to completely digitize the loan process using proprietary tech. Their target market is tech-savvy millennials—and they’ve streamlined the application process to fit these borrowers’ expectations. What are the benefits of refinancing with Laurel Road? Laurel Road claims their customers save an average of $20,000 or more over the life of their loans. Their variable rate loans start at just 2.50% interest. Many private lenders do not offer forbearance options. In fact, one of the biggest drawbacks of refinancing federal loans instead of consolidating them with a Direct Consolidation Loan is that you lose access to these options. Laurel Road is one of a few lenders to offer this kind of reassurance if your finances change. They offer a year of forbearance for borrowers who qualify. That kind of piece of mind is hard to come by with private lenders. Plus, as we mentioned above, Laurel Road offers some distinctive programs. One is refinancing for medical students going into residency or fellowship. Under this program, medical students can refinance their loans the minute they match to a residency or fellowship program. They pay only $100 per month throughout the program, and accrued interest does not capitalize while they’re enrolled. The parent refi option is also unique. Laurel Road is one of very few lenders that will allow parents to transfer their loans to the child, as long as the child qualifies. In addition, Laurel Road offers a referral program to all borrowers. If you refer a friend or family member who refinances their loans with Laurel Road, you could potentially earn up to $400 per referral. What refinancing options does Laurel Road offer? Laurel Road offers both fixed- and variable-rate loans. With fixed-rate loans, the interest rate stays stable for the duration of the loan. With variable-rate loans, it changes based on market conditions. Variable-rate loans usually start off with a lower interest rate, although that rate can change over time. You can select from loans terms of five to 20 years. Who is eligible to refinance with Laurel Road? Laurel Road offers student loan refinancing for borrowers with good credit histories. They will take a look at your existing finances, including your income, debt, and expenses, to decide if you qualify. Have at least $5,000 in student loans to refinance. Parents refinancing PLUS loans must have children who graduated from Title IV institutions. What are the rates and fees involved in refinancing with Laurel Road? Laurel Road offers fixed- and variable-rate loans with terms of five to 20 years. The longer the term of the loan, the higher the interest rate. Your credit score and finances determine which rate you qualify for. Variable-rate loans range from 2.50-6.66% APR (as of April 2019). Fixed-rate loans range from 3.50-7.02% APR (as of April 2019). Laurel Road does not charge origination or prepayment fees. That means that if you want to pay ahead to save money over the life of the loan, you can pay off the entire loan ahead of the due date without penalties. Does Laurel Road offer discounts? There is a 0.25% interest rate discount if you sign up for automatic payments. Apply online through Laurel Road’s easy-to-navigate platform. The whole process should take about 30 minutes and you’ll get a conditional answer within minutes. You know, the obvious…your name, your email, and a password for your new account. Laurel Road will ask you where you live and how long you’ve lived there. It will also ask for your social security number at this point. 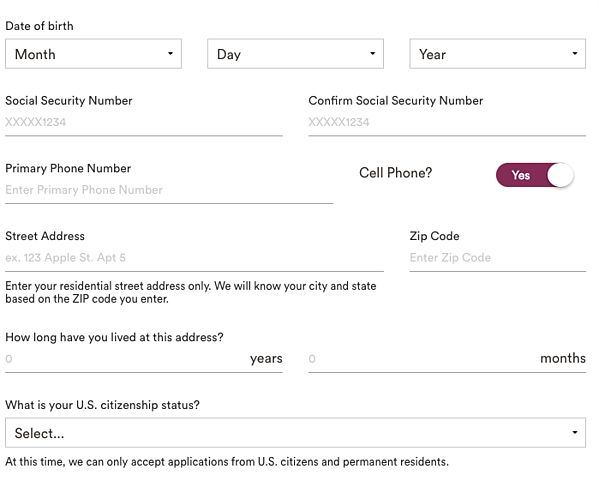 You will also need to provide details about your citizenship in this section. As we mentioned before, they only accept applications from U.S. citizens and permanent residents. 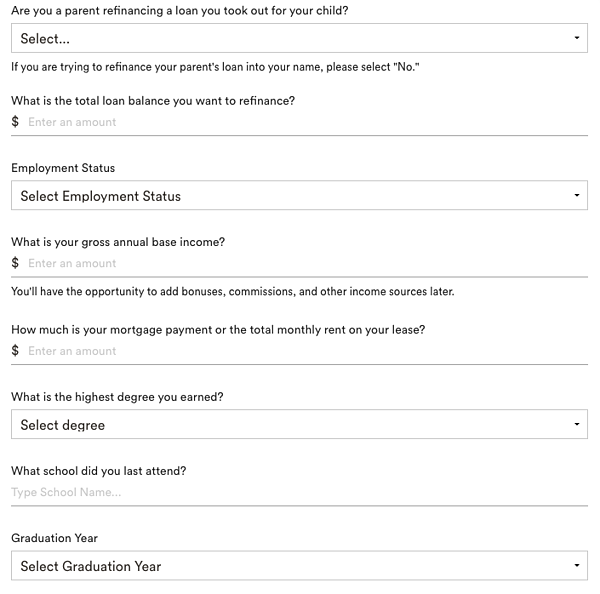 Laurel Road will ask you details about your finances—including your gross annual income, your employment status, and how much you pay in rent or mortgage. They’ll also ask you about your education. This info will help to form a clearer financial picture of your life both now and in the future. Your housing costs are one of your biggest recurring expenses unless you live in a no-rent situation, and your education gives them a clue as to your future earning potential. If you’re a parent looking to refinance a loan you took out on behalf of a child, now’s the time to tell them. After this point, Laurel Road will do a soft credit pull to assess your finances. This doesn’t affect your credit, but it allows them to get a more complete picture so they can provide you with an interest rate on your refinanced loan. Borrowers get initial rate estimates immediately after submitting the online application. You’ll get a final offer within 24 hours; just review, send back your e-signature, and you’re done. The entire process is digital—you can go from start to finish without talking to a person. If you want to talk someone before signing on, though, that’s possible too. 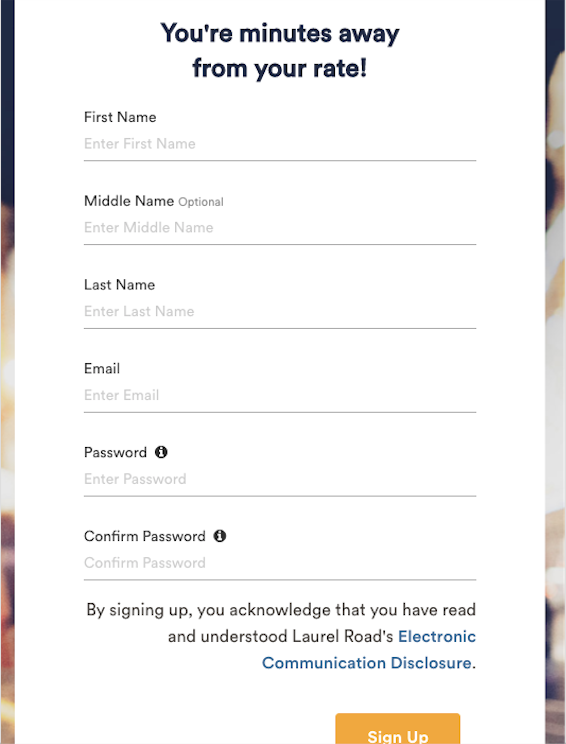 Laurel Road offers secure online chat (with a super-fast response time) as well as proprietary email. Should you refinance your student loans with Laurel Road? Laurel Road’s unique products for medical and dental school grads, as well as parents, make them a very attractive option for people in these categories. But there’s a lot to like even if you’re not this kind of borrower. They specialize in lending to millennials who have stringent expectations regarding customer service, speed, and tech—so younger borrowers will like the way they operate. They also offer low interest rates and flexible terms that anyone would like. Learn more about refinancing options from Laurel Road.